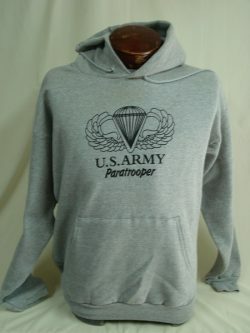 US Army Paratrooper Wings screened in blank ink on light steel hoodie. 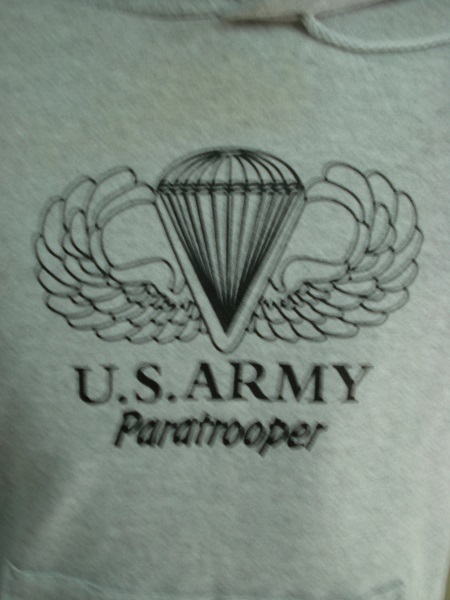 Airborne Front design only. 50% cotton, 50% polyester, 7.8 oz. printproxp® patented low-pill high stitch-density fabric; rib cuffs and bottom band; extra-large pouch pocket; dyed-to-match drawstring. Note, we use the best quality preshrunk hoodies available! Note, we use the best quality preshrunk shirts available!